It doesn’t matter where you are in the country, winter is always going to be a miserable time. If not for you, then for your house. The rain pours down, the snow gathers up around your driveway, and condensation from the heat within your home creates an often-damp environment. So, if there were ways to reduce the impact winter has on your home, would you take advantage of them? Of course. So, that’s where insulating house wrap right here in Denver comes in. Unlike traditional wraps for homes, insulating house wraps serve as an air barrier to protect and reduce the damage to your sidings and walls caused by water and condensation. It’s sealed carefully at the seams and is often a replacement for older-styled wrap systems which were less effective. When coupled with quality sidings such as those from Gravina Windows & Siding, you will notice a dramatic reduction in your standard property winter woes! 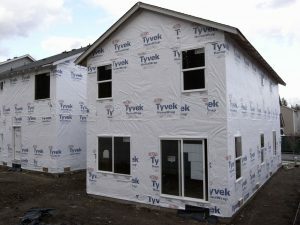 So why are people choosing to use insulating house wrap in Denver, opposed to standard forms of insulation and wrap? Here at Gravina’s, we pride ourselves on offering only the very best window, door and siding installments throughout the Denver Metro area and Fort Collins. Our staff are experienced and qualified, and we always go the extra mile. So, for us, installing insulating house wrap in Denver can be done with ease. Instead of using a secondary layer of material as a form of insulation which costs time and money, we use insulating wrap here in Denver that does not require any further insulation or installation. The insulating wrap is added to the house, all before we add our quality siding to complete the project. It’s as easy as that! Unlike traditional forms of house wrap and insulation mixtures, our insulating house wrap in Denver is durable and hardy against the winter elements. If you’re experiencing winter woes, you can most certainly rely on Gravina’s to get you through. Our full package of windows, doors, siding and insulating house wrap will get your house – either new or existing – fully up-to-spec for the impending winters ahead. With traditional insulation boards that are generally fitted underneath housing wrap, there’s a very real risk of mold. This is because water, if trapped underneath the boards in the installation process, cannot escape. Our insulating house wrap not only removes the need for those insulated battens or boards, but it’s breathable to allow water to escape. Water won’t get in, but it will certainly get out. While the colder weather is a source of woe for some people, so too is poor workmanship. Our staff are qualified and experienced to get your insulating house wrap installed perfectly, but we provide a warranty just in case. We stand by our workmanship and products, so you never have to worry about costly repairs if our workmanship is brought into question. When it comes to high quality insulating house wraps in Denver, siding, windows and doors, Gravina’s is your trusted and local installation company. We use quality brands such as James Hardie to ensure our customers are happy 100 percent of the time. In fact, our endorsements are testament to our overall image as a tried and trusted installation business for new and existing home builds. So, instead of experiencing three months of winter woes, why not be warm and comfortable this winter? Call (303) 936-7023 to get in touch for a free consultation and see what we can do for you. Fiberglass, Wood, or Steel – Which Door is Right for Your Home? Bay or Bow Windows – Which Type is Right for You? What is LP Diamond Kote® Siding?